This coral has a white-ridged hard skeleton that can be seen when the polyps are deflated. 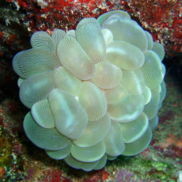 When inflated, the large fleshy polyps will cover the entire skeleton, and are white or yellowish in colour, a more pinkish variant is available. Like many other LPS corals, they do posses sweeper tentacles that can harm other corals within reach. This page was last edited on 8 August 2010, at 21:56.